Tire failures can cause some of the most dangerous accidents while driving. Inevitably, the loss of control is much unexpected and may even catch the pro motorists off guard. Most of the car owners can expect about 5-years from a new set of tires. But with proper tire care and periodic maintenance may add another year or two to the tires life. If a tire fails while driving, it will not only cause extensive damage to the body of your car and its components, but it can also pose a life-threatening situation to the driver and passengers if the driver loses control. Not to motions, the bits and debris of blown out tire would create a hazard to other drivers sharing the road with you. Under-inflation is amongst the most common cause of tire failure as the underinflated tires will run hotter & wear out faster. Due to excessive heat, the tread separation can occur, leading to a sudden tire blowout. To avoid under inflation, check the tire pressures occasionally. On the flip side, many people – being "Smart" – increase tire pressures to save fuel. Too much tire pressure will make your tires more vulnerable to damage. To avoid over-inflation, follow the recommended pressures and use proper equipment when measuring tire pressures. Since the tires carry the weight of your entire vehicle including the weight of the passengers and additional load, its imperative not to overload your car. Although overloading is a major problem in bigger vehicles, regular cars also seem to have this problem when moving heavy objects. Keep in mind! Pushing your car tires to its limit - despite the car tyre brands you use - can cause failure & additional damage to your vehicle. So just make sure you check the tires load rating before you plan to drive or while driving with heavy loads. Whether your premium car tires have been driven for thousands of miles or perhaps sat in the garage for years, there is no way you can stop the tires from aging and giving out at some point. If the tires are worn out, they have a minimal tread remaining that will contribute to less traction for sure. If you live in a region that experiences consistent rain, this can be dangerous when driving on wet pavements. 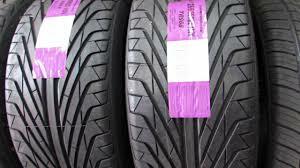 If your car tyres have gone old and are unused, you will see a little wear on the treads, but the rubber itself would have been deteriorated. Over time, the will start losing its elasticity and become harder, thereby making it brittle. Precisely, the car tires must be replaced often and should not be driven too long.